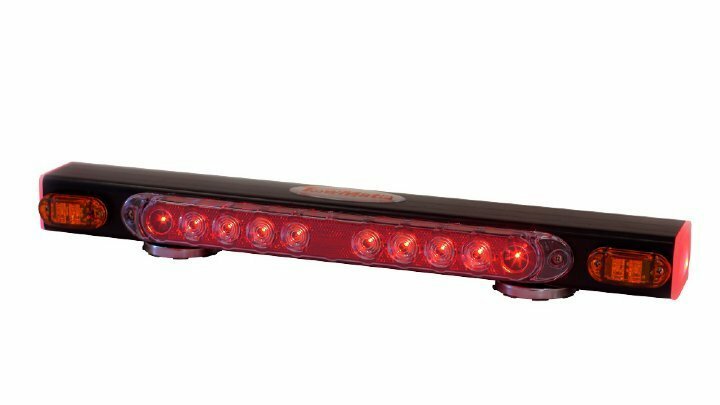 21" wireless magnetic taillight system w/ supplemental amber indicators provides stop, tail, and turn signals with ease. Brake function will illuminate the red light while the turn signal will illuminate the appropriate left or right side of the red strip and the correlating amber light. This system includes a charge cord to allow recharge from a cigarette socket and a 4-pin transmitter. Range 1000 feet. Uses one 12V1.2AH battery.